Being an educational clinic enables Penn Dental Medicine to offer discounted rates while giving qualified students the opportunity to receive practical experience. The words “dental care” and “discount” in the same sentence may seem a little absurd to some. Really, does inexpensive dental care even exist? 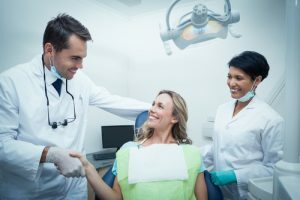 Dental care is an extremely important part of maintaining overall health, however, the prices for this care can sometimes be difficult to manage. Some people may find themselves choosing lower quality care or even neglecting dental care altogether due to the high costs. The University of Pennsylvania is an ivy league school and one of the best universities in the country. UPenn is especially well known for its expertise in the science and medical fields–producing some of the top doctors and dentists in the world. In the very final stages of the learning process, students begin to practice on real patients. This is where you come in. Student dentists provide quality dental care to patients under the guidance and supervision of the expert faculty doctors here at Penn Dental Medicine. This means that we are able to provide you with the highest quality of dental care at much lower costs. Our wide range of technological offerings, state-of-the-art tools, and elite-grade treatment procedures may be surprising to those who have had experience with discount dental care. Sometimes, discount care means cutting corners in quality–but because Penn Dental Medicine serves dual purposes, we are able to offer discount rate dental care with the top-tier, consistent quality that an association with University of Pennsylvania ensures. As an educational clinic, our dental service is mutually beneficial; it enables patients to receive affordable dental care while offering qualified Penn students the opportunity to receive practical, applied dental experience. For those interested in participating in our educational clinical dental care, the first step is to schedule an appointment for a consultation by our staff. We’ll need to assess several factors, including your medical history to your current dental health. To learn more about the discount dental care available at Penn Dental Medicine, contact us today! We’ll be glad to offer any information you need or answer any questions you have.